Hey there, Esteemed Reader. I hope your weekend is going well. Mine is swell, thus far. I had time yesterday and today to do some serious writing and as soon as I finish this post, I’m going to get back to it. And, of course, I’m reading the last of Dawn Lairamore’s Ivy’s Ever After in preparation for the next Book of the Week. But it can’t be all about reading and writing, Esteemed Reader, it just can’t. It’s important we writers take time to do normal people stuff too. So yesterday Mrs. Ninja and I went on a date to see Toy Story 3 in Imax 3D. If you like the Toy Story movies as much as I do, that’s the way to see it. We loved the flick, of course. Mrs. Ninja cried, but you’ll be happy to know that the ninja was a rock. Still, it was an emotional story well told, but also filled with action, and, more important, Michael Keaton. I think it’s better than the first two movies and when I get a chance, I’ll be watching it again. Two thumbs up, five out of four stars! But this isn’t a review. Rather, I just wanted to mention how dark the story was in places. One of the new characters is a teddy bear that was lost by his child owner and when he came back to her, he found her parents had bought her a replacement bear. This, naturally, sends him off on a quest for power by subjugating all other toys, and he’s probably one of the greatest villains in cartoon history. But man, what heady stuff for a kid’s movie! This bear has multiple monologues about how no one ever really loves anyone and we’re all replaceable. Darker yet is the uncertain fate of Buzz and Woody now that their child has grown up and there is no one left to play with them. Their options are not appealing. They can live in the attic in the hopes that Andy one day has children of his own to play with them, or they can be put to slow death by the crazy teddy bear, or they can be thrown into the junkyard and possibly burned. 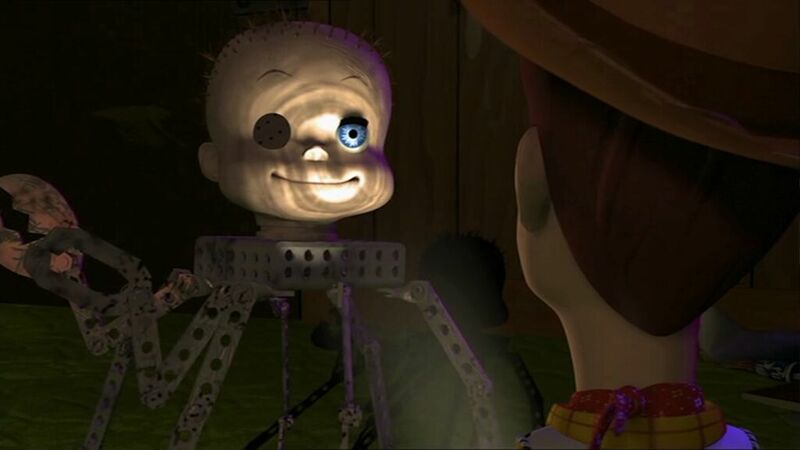 After viewing this movie, I have decided it is probably best inanimate objects such as toys don’t really come to life. Although, if they did, my toys would be quite pleased. As I write this, all three hundred plus of my Batman action figures are on a shelf looking down at me. I don’t play with them anymore—okay, once every so often I’ll pull a batmobile down and make a vroom vroom noise—but at least I didn’t burn them to death. Minor spoiler: Toy Story 3 contains probably the darkest scene I have ever seen in any children’s story ever, including all of Wall E. Near the end of the film, all of the beloved toy characters are in a pile of junk being moved toward a great flame that will melt them down and destroy whatever magic brought them to life in the first place. The toys realize they cannot escape death and so say their goodbyes to each other. And then they hold hands and prepare for the inevitable. And they all die. Oh, did I say minor spoiler? I meant major spoiler! If you believe Pixar ends their most profitable franchise by killing off Buzz and Woody and everyone else, I’ve got a credit default swap I’d like to sell you. But the scene of the toys accepting their death is haunting and has stayed with me long after the funniest jokes in the movie have faded. I actually dreamed about it last night. And this is a scene that goes on for at least a full minute, maybe two. I don’t think I’ve seen anything in a recent adult movie so dark and gut wrenching. Children across America are watching this movie and probably just fine with it. But adults, be warned. I’m officially working on a new book this weekend, The And Then Story 2: And Then Harder (With a Vengeance). I’ve had an outline for it since I was halfway through the first book, but now I’m filling in the details. I’m going a little darker this time around with a scarier story and a heavier theme. I’ve worried that the book might be just a tad too dark for my target audience of boys 9-12, but after watching Buzz and Woody come to grips with burning to death, I’m no longer worried at all. Apparently, there’s no such thing as too dark. You may be wondering if it’s perhaps a little soon to start a sequel to a book I haven’t even submitted to a publisher yet, and you may be right. But one, I’m pretty confident that The And Then Story (not really the title) will find a publisher. Two, I intend to be open about the fact that I’m planning a series, so publishers will likely want to know what happens in the next book and I won’t really be able to tell them until I’ve written it. And three, who cares about publication? I know, I know. All of us writers do. But simple publication isn’t a reason to write. When I was in high school, I spent a summer making a feature length horror film on the budget of a summer job. It was a lot of fun and one of my favorite memories of that time. The movie isn’t available at your local video store and I’m not going to put it online (too embarrassing now). But I loved that movie. I wrote, directed, and paid for it and to feed the actors. I wrote two sequels to that film, but the cast split up to different colleges and it wasn’t to be. I can’t publish the screenplays, nor would I want to, and the movies will never be made. But I’m not sorry I wrote them. I learned more about writing and they made me happy in the act of their creation. So who cares if the world wants The And Then Story 2 or not? I want it, and that is reason enough. If it doesn’t work, I’ll consider writing a dystopian vampire romance. That’s enough from me. I’ve talked about darkness in children’s stories before in my reviews for Drizzle and Charlie and the Chocolate Factory. What do you think, Esteemed Reader? How dark is too dark when writing for children? Are there any books or movies marketed to kids you feel crossed the line? I can't wait until my daughter is old enough to watch these! This movie sounds great--and oddly, deep! Glad you were a rock, man. Thanks for the warnings about the darkness, as doubtless I'll be taking my trio out to see this one of these fine days.